Until now we’ve presented only Portland case studies, but having lived in this wonderful Seattle building, I feel compelled to present it to you. This 1920s courtyard building is located at 24th and Cherry in Seattle’s Central District. This building exemplifies the best qualities of the courtyard format, and takes some steps to mitigate some of its downsides. The grade separation of the courtyard from the sidewalk on the gently sloping lot allows for some additional security and privacy for residents. This building’s owner has really outdone himself with the landscaping, creating a Tuscan garden complete with a six foot high cast iron fountain. In a fairly typical arrangement, the building was constructed with a line of garages facing the side street. One of these has been converted into a laundry room with storefront glazing. The owner has rented the remaining garages to microbusinesses, including a letter press, a community supported agriculture distributor, a wooden canoe builder and a kombucha brewer. The basement of the building, which occupies the space beneath the end of the U is occupied by a makers space coop, which also has its wood shop and metal shop in two of the garages. Side view with garages (now used for micro-businesses) and entry to basement makerspace. 2031 N Watts St. is a rare and unusual form of hybrid court, with wings of townhouse units flanking an end bar of four stacked flats. Each unit has its own exterior front door leading to the courtyard. We were quite surprised when we looked this one up on Portland Maps and discovered it was constructed in 1927. The building’s exterior, windows and doors, as well as courtyard paving and landscaping appear to have been installed less than ten years ago. The overall impression of the exterior overhaul makes the building a bit austere, compared to an unaltered 1920s specimen, but it’s still a nicely proportioned, human scaled place. This building has no off-street parking. With 100’ of street frontage, there is room for 5 cars to park in front on the street. We’d like to see more new residential projects take this form. The tricky part is making a small rental that is profitable given high land and construction costs. If this were for sale as condo, the project would pencil out, but we haven’t seen may examples of developers willing to risk developing for sale housing without off-street parking. 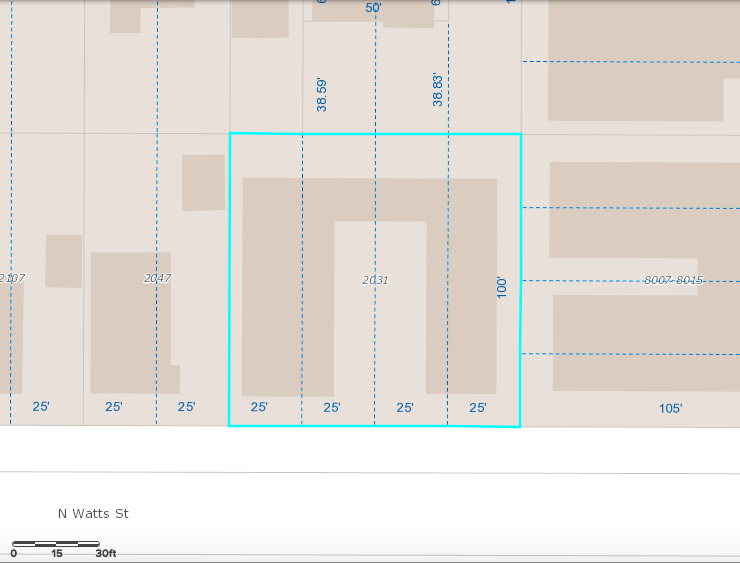 This lot’s zoning could in fact accommodate one more unit. 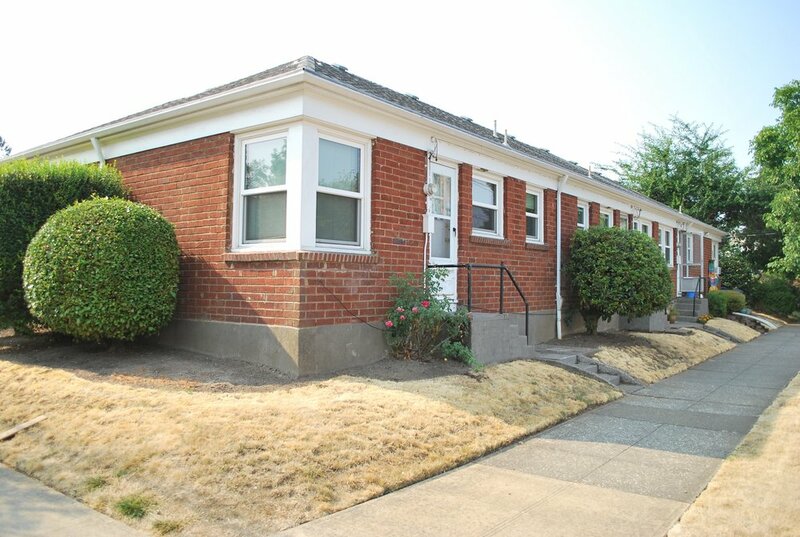 R1 allows 1 unit per 1000sf of site area, and this is a fourplex on a 5000sf lot. 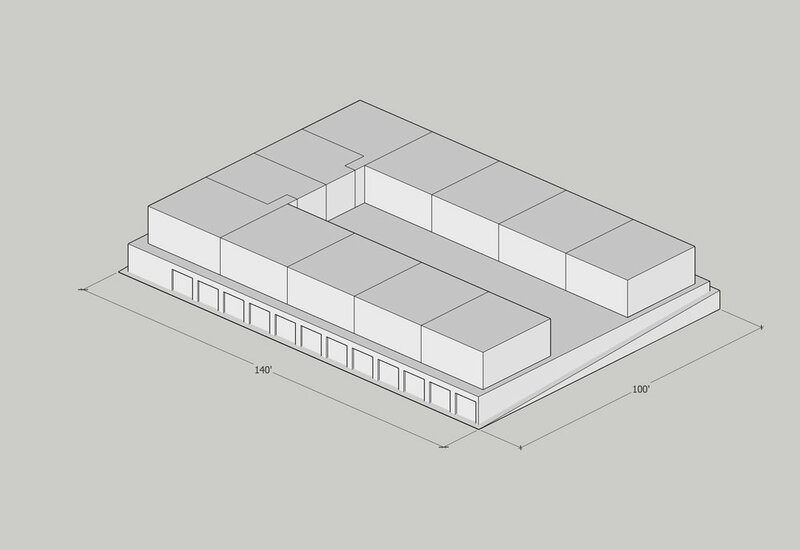 The building even has a detached 2 car garage to the side (potential adu on top?). Note the fact that the front of the building faces the long side of the corner lot. 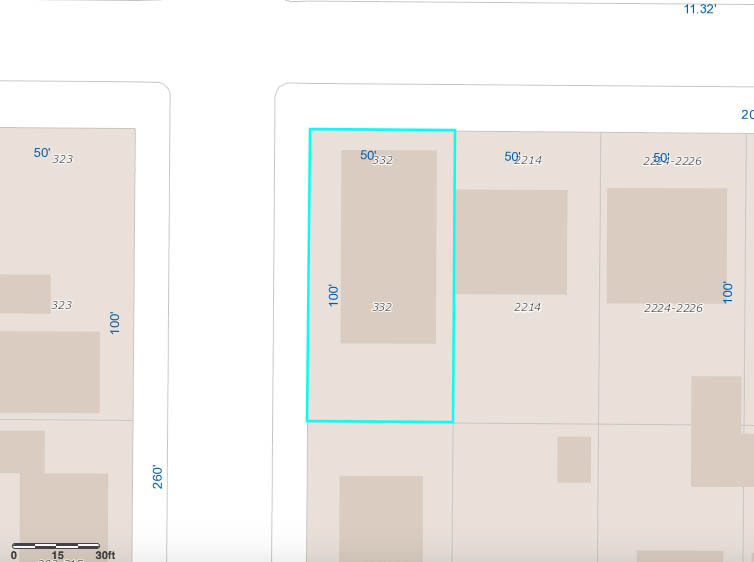 As we saw in the previous post, there are unique advantages to corner lots for small multifamily buildings. 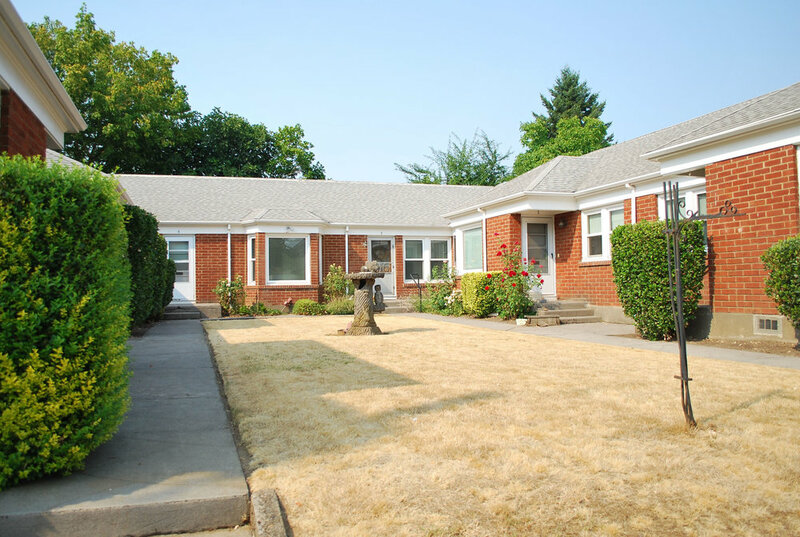 By taking advantage of a double length frontage, a building can maintain a proportional relationship with the street that is pretty comparable to that of a single family house on a standard mid block lot. An additional advantage to corners is the amount of curb frontage for on-street parking. There is easily enough room for 5-6 cars to park on around this building, whereas on a mid-block lot there would only be frontage for two. Corners can thus mitigate some of the burden on this scarce resource. Coming in at slightly less than 900sf each, these are very generous apartments. They could conceivably house a small family consisting of a couple with one child in each unit. That’s not quite as far fetched as it might sound either; the first post-war suburban tract homes in Levittown were as small as 750sf!